CJ Stander, Devin Toner and Keith Earls are doubts for Ireland’s Six Nations game against Scotland after picking up knocks in the 32-20 defeat by England. Ireland coach Joe Schmidt said back row Stander had gone for a scan on a facial injury and that wing Earls had been forced off by a hip injury. “Keith Earls is pretty sore, with a hip issue; he got hit a couple of times early,” said the Ireland coach. Second row Toner has an ankle concern ahead of the trip to Murrayfield. “CJ Stander we think has a facial injury and has gone for a scan,” explained Schmidt. Schmidt added that lock Toner had “rolled his ankle” when landing after catching a kick-off as Ireland’s hopes of achieving back-to-back Grand Slams were ended in emphatic fashion by Eddie Jones’ side. Earls was replaced by Jordan Larmour at half-time after being on the receiving end of high tackles from Tom Curry and Maro Itoje. Curry was sin-binned by referee Jerome Garces for his challenge on Earls with Itoje conceding a penalty in the second incident. Asked about Itoje’s tackle on Earls, Ireland coach Schmidt responded: “I’m not going to get into any discussions about that. I’m going to go through the normal channels. “I’m just going to ask for some clarification on some of the incidents we saw and once I get that we’ll have a better, clearer picture and we’ll have a better expectation of what referees are actually going to deliver in terms of player safety and then we can springboard from there. “It got quite physical but I don’t think necessarily that that was part of a plan. “It certainly put Keith out of the game and he was our most experienced back-three player,” added the Ireland coach. If Earls is ruled out, Andrew Conway, Will Addison and Adam Byrne would be among Schmidt’s wing options in addition to Larmour. 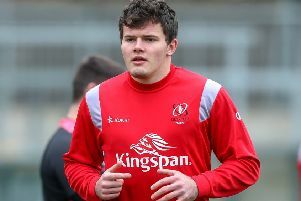 Sean O’Brien replaced Stander after 65 minutes in Saturday’s bruising contest while Jack Conan, Rhys Ruddock and Jordi Murphy could also be in contention to be drafted into the Murrayfield squad.